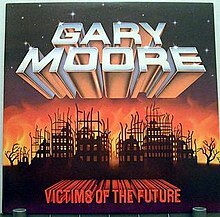 Here’s another example of how I was so focused on heavy metal in early 1985 that I didn’t fully appreciate a good non-metal album. 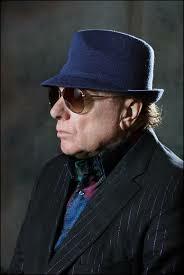 I have to admit, back then I didn’t have much experience of the legend that is Van Morrison. My most memorable experience of him was his performance in the film, “The Last Waltz” where he sang with The Band. Other than that, what I knew of him was virtually zero. While by 1985, I had become totally fed up with commercial radio, I have to thank it for this one. The single from the 1985 album, “A Sense of Wonder,” “Tore Down a la Rimbaud” got a considerable amount of airplay in the early part of the year. It was only after a few listens that I got past my “it’s not metal” mentality and realized that “Hey, this song is pretty good.” However, for some reason, I never bought the album, which was a bit of a shame because I missed out on a good one. Wikapedia puts Van’s “A Sense of Wonder” album in the category of Celtic Soul. Well the man is from Northern Ireland and he does put his soul into the album so it’s hard to disagree with that label. Back then, I would have put it into either or both of the categories of soft rock or mellow out rock. It covers both. While the deafening power chords I was so into in 1985 and still am today are absent, one can’t fault the quality of the musicianship on it. Here’s another myth I believed about Van which this album has obliterated. I thought that he only sang because that’s what he did in “The Last Waltz.” But he plays guitar and piano and rather well judging from the instrumentals “Evening Meditation” and “Boffyflow and Spike,” the latter sounding like true Irish folk music. While the single remains my favourite song on the album, the rest of the album keeps up as well. In my opinion, “Ancient of Days” could have been released as a single too because it’s almost as good. After the first mentioned instrumental, he goes very almost gospel soul softer though I think the title track goes on a bit too long for me. The second instrumental does pick things up a pace after and “If You Only Knew” keeps that pace going with “A New Kind of Man” closing the album out with a good feeling. I’m now a believer. 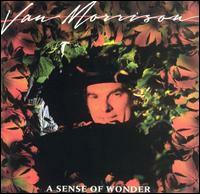 Again, it could be me mellowing a tiny bit with age but I now appreciate how good the “A Sense of Wonder” album from Van Morrison really is. Perhaps I should delve into his discography a little more. I don’t think I’ve said this in previous posts about U2 but the one thing their music definitely did was appeal to Metalhead and Duranie alike. For those who don’t know, a Duranie is someone who was into Duran Duran and similar type music. Those people listened to U2 and did not feel that they were going too weird in their music tastes while Metalheads could do the same without any feeling of selling out and going mainstream. 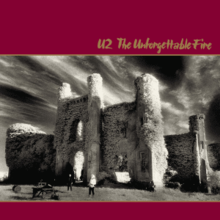 “The Unforgettable Fire” album continues this trend for the band as both of those groups bought this album up. Reading the history behind the making of the album, the band has said that they were trying to steer a different direction with it as they didn’t want to be labeled as another arena rock band. Let me be totally honest here, I have never heard anything different in the sound of “The Unforgettable Fire” than what they had accomplished with their previous three studio albums. What U2 had been able to do very well with all four of their albums to date was make different sounding songs without having to change their overall style. I have always believed it was a case of more of this with the fourth album. With “The Unforgettable Fire” the hits come out straight away, probably because I heard the first single, “Pride in the Name of Love” on the radio before I bought the album. History states that the single was released first so that’s probably why. Still, it ranks up their among my favourite U2 songs of all time. The second single, “Bad” is the second single released and that stands out as well while at the same time, you know it’s a good U2 song. I could never fathom why the title track never charted in North America as it’s a really cool track as well. If anything, I would rate it above “Bad.” But if you know me by now, albums aren’t about the singles on them and there has to be some hidden gem in the album. For me, that track is “Wire.” If I had my way, that would have been released as a single. I like the little guitar lick The Edge uses at the beginning before it goes into a good rocking song. In fact, The Edge shows his guitar skills all through the song. Actually, “Indian Summer Sky” is a really good song and that’s what you need for a good album. The other thing which definitely appealed to me back in 1984 was U2’s use of politics in their music. This continues with this album, especially as two songs are dedicated to the late Martin Luther King Jr, one of them being the first single. “Bad” was about heroin addiction and the idea for the title track came when the band was visiting the war museum in Hiroshima, Japan. Put these things in with the music on the album and it’s no wonder why I liked it so much. New feature: Seeing what has been done on other blogs and now that I know that I don’t have to pay WordPress ridiculous amounts of money for the privilege, with every album post, I will include a track from said album. Typical me, last on the bandwagon. In this case, since I have sung the praises of the track “Wire,” it will be featured here. Heavy metal was going strong in 1984, so was U2. This album is clear evidence of that fact. Maybe U2 were trying to follow in the lead of Blackfoot in the sense that after three albums, release a live album. The difference here is that the three Blackfoot albums are all considered classics while the same can’t be said for the three U2 albums. Now don’t get me wrong, I like all three of these albums, “Boy,” “October” and “War.” However, the first two didn’t propel them to stardom the way “War” did. “Boy” turned my head in their direction but when I mentioned U2 to others, I mostly got blank stares. “October,” on the other hand, is U2’s best kept secret. Not a lot of people seem to know too much about the album but I’ve always liked it. “War” goes without saying, it made the band a worldwide name. It is on the back of “War” that the live “Under a Blood Red Sky” album was released. When most people think of this live album, they automatically assume it’s from the filmed concert “U2 Live at Red Rocks: Under a Blood Red Sky,” it’s not. The songs are live but recorded separately from concerts in Colorado, Boston and Germany. Furthermore, the filmed concert is nearly and hour and a half long while the album consists of just eight songs and is just over thirty-five minutes. Ironically, the album starts with the best known song from the “October” album, “Gloria.” Probably a good opener as any for U2 at this stage of their career. What’s more, the next two songs are off the “Boy” album but then, “I Will Follow” is my all time favourite U2 song and it’s played very well. The crowd really get into it and if I had been there, I would have too. The fourth song, “Party Girl,” doesn’t appear on any of the albums but it’s still okay. 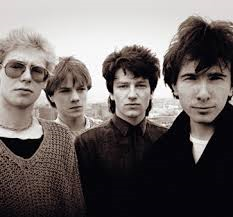 Remember, back in 1983, U2 were still hungry and making their mark on the music world and all of the songs reflect that on the album. It’s not until song five we get anything from the “War” album and that is the phenomenal “Sunday Bloody Sunday.” My second favourite U2 song and the way it’s played here is pure magic. Next is another good song from the debut album in the form of “The Electric Co.” For me, it’s played just as well live as when I hear it on the “Boy” album. Were there studio fixes here? I can’t say. The last two songs from “War” take the album out brilliantly. First is the fantastic “New Year’s Day” and there is no better song for them to close a concert with than “40.” When I saw them in 1985, they would close the show with that song and it was mind blowing. 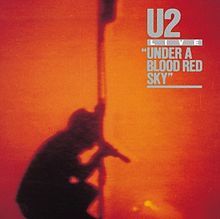 I have to say that “Under a Blood Red Sky” takes me back to another time and almost seemingly another U2 because they were actually good but it hadn’t gone to their heads yet. “Under a Blood Red Sky” may not go down as one of the greatest live albums in history but it’s still a good album. Especially if you like U2 when they were more hungry and less with the ego. “Thunder and Lightning” might have been the final studio album for Thin Lizzy but that didn’t mean they were in any way finished. Further along in the year, 1983, the band released the live album, “Life.” The album was recorded over a series of concerts played in September and October, predominantly taking place at the Hammersmith Odeon in London. The closest I got to ever seeing Thin Lizzy live was seeing the tribute band, Limehouse Lizzy, in Stroud over ten years ago. It’s a shame they never came back, but I digress. Both the tribute band and this album make me regret the fact that I have never seen the actual band in concert. What I have heard in both camps here give me the impression that they would have been sensational, but no use crying over something I have no control over. 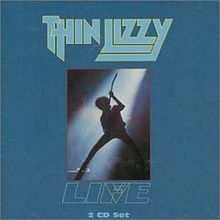 It wouldn’t have taken a computer to deduce the fact that any live album late in Thin Lizzy’s career would have been a glorified greatest hits album. Having owned their greatest hits album, (I have it on cassette), I can attest to this. Still there are some great surprises on here, starting with the fact that “Thunder and Lightning” would be the best track to open the live album or any concert. They play it just as loud and proud live, maybe more. In fact, the songs from “Thunder and Lightning” are all played rather well, “Cold Sweat” definitely gets an honourable mention here. In addition, in my mind, they pick the right songs from that album to play on this one. Saying that, I like the live version of “The Sun Goes Down.” To me it seems more sinister though it does go on even longer than on the studio version. Of course, all the great Lizzy classics are on here and most of them are played very well live. I only have to wait to the third song to hear my all time favourite Thin Lizzy ditty and they definitely do it justice. Other notable efforts are “Emerald,” “Black Rose,” “Waiting for an Alibi,” “Hollywood (Down On Your Luck)” and if they genuinely closed their shows, with “The Rocker” like they do on the album, then it was a very wise choice indeed. A great song to go out on. 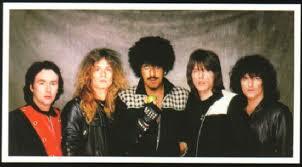 Additionally, Phil Lynott got the former Thin Lizzy guitarists to play on different numbers on the album. 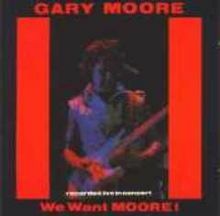 Gary Moore, Snowy White, Eric Bell and Brian Robertson all play on the album. I now know why “The Rocker” was such a great closer. That’s because all the guitarists mentioned as well as Sykes and Goram of course play on the final song in what Phil calls ‘The All Star Jam.” That was great to hear, it must have been mind blowing to see. In November of 1983, I met up with a friend who was on leave from the army after spending two years stationed in Germany. Before he left the country, he got to see Thin Lizzy’s last ever gig in Nuremberg. I don’t remember many of the details but it sounded like an amazing event. They played many of their classics more than once and “The Boys are Back in Town” three times! Boy I was jealous, still am. I have to settle for the next best thing, this live album. Before I launch into the final studio album from one of the greatest rock bands from the 1970s, I feel I must bring to everyone’s attention the boo-boo I made on my last post. Having looked at it, I realise that I never posted the photos I took of the headline band, Twister, that night. I have since rectified this mistake and the photos are there for your viewing enjoyment. I’ve listened to a couple of Twister songs on Youtube and they’re quite good. Yes, “Thunder and Lightning” would be the final studio album from Thin Lizzy. 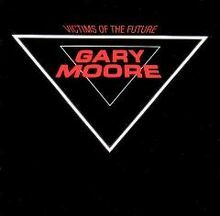 My first experience of this album came in 1986, when partying in my college dorm room, my new British friends and I were making a tape for my sister. 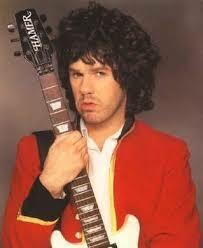 A Thin Lizzy song was suggested and “Thunder and Lightning” was further suggested. Upon hearing that suggestion, the Thin Lizzy officianado in the room stated that it was the worst Thin Lizzy song you could play. Having to decide things like that for myself, I listened to the album and I never agreed with my friend’s opinion. 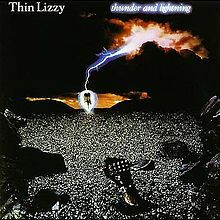 Whether it was the addition of John Sykes on guitar or Thin Lizzy trying to jump on the new wave of British heavy metal, (NWOBHM), “Thunder and Lightning” is the heaviest Thin Lizzy album I have experienced. The title cut opens the album and from the first notes, you know that this is a much heavier brand of Thin Lizzy. That heaviness carries on through the second song as well. However, things slow right down with “The Sun Goes Down.” This one is much slower, a rock against the tide of the rest of the album. Still, there is some good keyboard work on it and I have always been a sucker for a great slow blues guitar solo. However, the song does drag in some places. “The Holy War” returns things to its natural pace. While not quite as hard as the first two tracks, it does deliver through the melodic hard rock avenue and it’s possibly my favourite track on the album. It’s melody is quite catchy. That track sets up the rest of the album. From then on it’s one hard tune after the other, sort of a one, two, three, four, five punch. The opening riffs of “Cold Sweat” give that away. Even then, I can still hear the what some would say as traditional Thin Lizzy coming through and there is some good soloing from both Goram and Sykes. One song that really intrigued me on “Thunder and Lightning” is “Someday She’s Going to Hit Back.” The title suggests this is an anti- domestic abuse song and having a read of the lyrics, it seems to support that theory. Here’s the paradox. This music to this rocker is really cool with another great guitar solo. However, I fear that on account of that, the message of the lyrics gets lost in the song. Just an observation here. Then comes “Baby Please Don’t Go,” another cool hard rock song but I am left to wonder if the last song sets up this one. However, both songs lead the way out for the album which ends on a terrific closer in “Heart Attack.” Not to take anything away from the penultimate song as that’s a good one too. Usually in the case of final albums, they are a lackluster offering from a band whose attitude is to get it done and go. This isn’t the case here with “Thunder and Lightning.” There was some good thought put into it. Some say that the lyrics aren’t up to much but that’s a technicality. The music more than makes up for it. Definitely the rockingest album from Thin Lizzy.